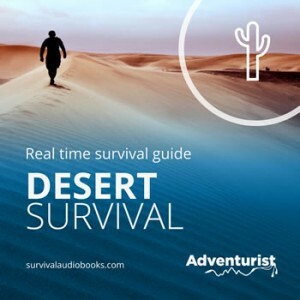 This Desert Survival Guide audiobook talks you through, step by step, what to do in an emergency or survival situation if you find yourself stuck in a desert in hot and dry conditions. For quick navigation, the survival audiobook is in survival priority order. You can quickly skip to the chapter which best fits your situation. As the audiobook plays there will be prompts to act upon and there are spaces of a few seconds in the commentary to allow you to complete tasks. The audio will then carry on, but you can pause it and restart it at any time.